A massive unionist rally is being organised to mark the centenary of the signing of the Ulster Covenant, the 1912 declaration by over 400,000 northern unionists of their opposition to a British plan to give Ireland Home Rule (devolved government). The existence of the Covenant was ultimately used by the British government to justify the partition of Ireland. 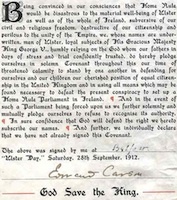 The Covenant had two basic parts: the Covenant itself, which was signed only by men, who vowed to use “all means which may be found necessary to defeat the present conspiracy to set up a Home Rule Parliament in Ireland”; and a Declaration, which was signed only by women, and contained no threats of violence. Tens of thousands of loyalists and Orangemen are expected to parade through Belfast in September in the event, which has raised concerns among nationalists. The main demonstration is set for Saturday September 29, the day after the centenary of the signing of the covenant. One of the locations being considered for the rally is the grounds of the Stormont Assembly, while the march is likely to parade past Belfast City Hall, where the document is housed in Belfast city centre -- four miles away. The event is one of two major public demonstrations to mark the covenant signing. There has also been controversy about a separate event in May planned for Ormeau Park in south Belfast, which would mean controversial ‘feeder’ parades taking place in the area. The plans were unveiled as a British Direct Rule Minister ironically warned against republican ‘dissidents’ using the upcoming Irish historical centenaries to further the cause of Irish unity. Hugo Swire, ‘Minister of State for Northern Ireland’, made the comments during a debate on the forthcoming 100-year commemorations at the British parliament this week. Swired was concerned only by the possibility of events being organised to mark the anniversary of the 1916 Rising. “These are the people who oppose forbearance and oppose conciliation,” Swire said. Meanwhile, efforts are still continuing to convince the Dublin government to preserve important sites of the 1916 Rising from destruction. Descendants of the leaders of the Rising are calling for a cultural and historic quarter to be established between 14 and 17 Moore Street, where some leaders of the Rising met for the last time in a site often referred to as ‘Ireland’s Alamo’. The houses were designated as national monuments in 2007, but are in the ownership of a developer, whose loans have now come under the control of NAMA, the government’s property agency. Pressure is growing for the state to take ownership of the properties and use them as part of a heritage area in the city centre in time for the 1916 anniversary. James Connolly Heron, great-grandson of James Connolly, said current plans for the site would involve gutting the Moore Street houses, whereas the relatives wanted an “Anne Frank house approach; that whatever was there in 1916 must be kept intact”. In other anniversary news, the original Anglo Irish Treaty document of 1921 has been made available to the public for the first time in an online exhibition to mark 90 years since its signing. The treaty was signed in the aftermath of the truce which ended the 1919-1921 War of Independence. It brought about the partition of Ireland and, ultimately, the creation of the 26-County State. The National Archives in Dublin said the Anglo-Irish Treaty of 1921 was “probably the seminal document of the Irish Free State, which in turn evolved into the Republic of Ireland”.